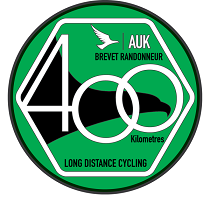 402km cycling event starting from Bushley. Controls at Leominster., Llandovery, New Quay, Llandovery and Abergavenny, plus 3 information controls. A fast pretty route up to Leominster for breakfast in a choice of commercial venues. the route continues in a similar vein to Builth Wells, the gentle rolling route starts as you leave town and continues until a long descent to Llandovery and lunch at The West End Caf�. After a gentle warm-up, the climbing starts to and through Lampeter. there then follows undulating lanes and quiet B-roads to the little seaside town of New Quay where you'll control at The Mariners Caf�. The return is initially a retrace, a slight divert through quiet roads through Llanybydder, picking-up the outward route and descending back to Llandovery once again. There then follows a simple navigation along the A40 to the next control at Abergavenny. You then have a choice either take the slightly shorter old road, or the newer road back through Monmouth. After Monmouth the route takes the Wye Valley riverside route, ultimately through Goodrich and out of the Wye Valley along benign lanes short stretches of A roads back to The arrive at Bushley.